Fix resending of past email with attachments. Added Reset button to dispatch window font and size. See Settings, Dispatch tab. Updated data browsing code (internal) to latest version. Hide drop-off date and drop-off time in duplicate trip window if the option to hide those fields is checked in the LimoWiz settings. Update multi-trip billing: was considering deleted accounts in rare situations when an account was deleted and the account created again with account number. This issue did not occur if index and compress was performed. Prevent trip charges re-calculation if a trip is settled and paid and the Override checkbox is not checked. If trip settled and paid, no recalculation occurs. NEW: update Pay Method of selected passengers of a certain account. See "Update Pay Method" button on passenger window. Usage: select passengers to change; see Record selection help!, then select Pay Method from drop down list, then click the update button. This new feature will save you a lot of time if you have many passengers under a certain account. This option is only available when looking up passenger of a certain account , not when listing all passengers from Browse menu. Fixed RTF terms not being included in plain text email. If tax effective date is blank (in Settings) or trip date is greater than tax effective tax, tax will be calculated. Updated HTML Editor to version 3.0.5. Addressed an issue with opening HTML files. Download link is separate and found on members page. Added "WIRE TRANSFER" to How Paid drop down list on trip payment window. Fixed an issue with 12.3.7 which caused blank display of actual and drop off times on trip window. NEW: Force Multi-Trip Billing new setting can be turned on the Billing tab in the LimoWiz settings. Changed behavior of trip charges recalculation so that external changes in settings do not affect old trips that are being viewed. Fixed issue with sending email when an email address field contains multiple email addresses separated by a semicolon. Tax Effective Date: if you change the tax calculation criteria in the Calculation tab, you can set a new Tax Effective Date to avoid updating tax old trips. Backup Utility now allows you backup to two (2) target paths. For example local hard disk and and external USB drive. Backup utility improved user interface and feedback. Trip payment has an optional Payment Note which you can use to add additional note. 100 Characters maximum. This note is included on reports and emails. NEW: Email engine component which features faster connection, auto fix email server connection settings. NEW: Override Charges check on trip window so automatic calculation do NOT occur and you can then enter you own fixed amounts. This option has an effect only when a trip is not paid and not settled. If you are using real-time credit card processing and you select a credit card payment type but you do not select a credit card, LimoWiz will display a warning. 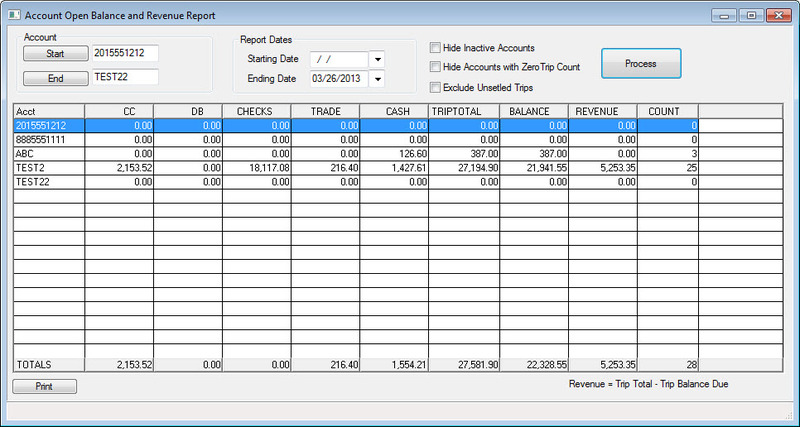 Fixed data entry tabbing order (sequence) on trip window. Changed the account and passenger import of text files from comma delimited to TAB delimited. This is normally used by new LimoWiz users. Single Trip Invoices removes the ATTENTION line if not specified in account. Previously it was using the contact name under trip; it is not always the case that contact name the same as billing's attention name. NEW: When setting trip status on dispatch window to X (Canceled Not Billable) and driver or car is assigned, a prompt will be displayed to remove driver and/or car. Updated the method of trip charges calculation and re-arranged the gas surcharge and admin fee display. NEW: Total Due ONLY email confirmations, invoices and receipts. To turn only see Settings, Email Account. NEW: Total Due ONLY multi invoice by Ref No option. See Report Styles under Bill icon (Multi-Trip Billing). Fixed email confirmation and email receipt buttons from the Trip Saved dialog upon saving trips. Updated LimoWiz HTML editor to version 3.0.4 and several improvements. Now it has the ability to insert Image URL (a web link to image). Added sales contact Fixed Commission amount to contact's profile.. Previously only a Percentage was available. Added Driver Role option to set LimoWiz user as a DRIVER. Then driver can login into LimoWiz, however, their access to certain functions like printing own trips from the Dispatch window. As an administrator you can set the role in the user setup window. See Tools menu, LimoWiz Users Setup. NOTE: The User ID that you add MUST BE the same as the driver number (ID) that you have under the driver's profile. This feature is like having a LimoWiz Driver program! New: You can add custom footer messages for Multi-Trip Invoice and Single Trip Invoice. See Settings => Invoice Messages tab. One Page Contract can now be printed from within the trip window. Updated time-out display on status bar. Account Payments Report has been updated to include total amount of payments. Also updated report text. FIX: Service Type discount percentage was not being saved when updating service profile. Updated trip handling of service type discount percentage. A prompt to update the discount will be displayed when applicable. Service Type gratuity percentage will now be preserved if a new Service Type is selected which has a zero gratuity percentage. Gratuity amount will be recalculated accordingly to reflect any update to trip charges. LimoWiz now displays a message if you are trying to edit an invalid file in the Settings window and displays a possible solution. Updated Account Open Balance and Revenue Report. Now they are on one report with additional options. Start date will be blank. Ending date will be today's date. Quote Copy button in trip window now generates HTML formatted text instead of plain text. You can also customize the footer text in the LimoWiz Settings - HTML terms tab - Price Quote Message Footer. Automatic Payment Receipt may now have an optional footer. You can also customize the footer text in the LimoWiz Settings - HTML terms tab, Payment Confirmation Invoice Footer. Updated LimoWiz HTML editor to version 3.0.3. Fixed some issues with HTML loading files. Trip contracts print a "test" text instead of actual terms & conditions. This affected print from within trip edit screen. Dispatch window worked fine. LimoWiz HTML editor and RTF editor updated. They can now handle file names with spaces. NEW: option to blank trip zone and/or trip service type when adding trips. See Settings, first tab page. This may be used if you wish to force always enter trip zone and/or service type instead of pulling account defaults setting from its profile. NEW: option to select "One Page" or "Two Page" trip contract. The default is "Two Page" page contract. See Settings, second tab - report styles. New multi-trip invoice to include "Paid" and "Unpaid" trips on invoice. Boost application performance especially when accessing LimoWiz data over a network. Added Verify Flight button to flight information window which is accessed from the routing window. Updates to Tool menu to include the HTML and RTF editors. They are now separate downloads from member center. Fixed routing line Erase Line button. Added zoom to driver and vehicle picture. Double click to bring a larger view!.